There are certain things I leave to the professionals. 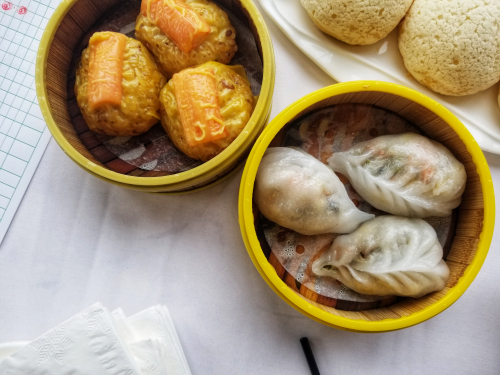 Dim sum at home? Um, no. I am sure that there are some who could tackle whipping up a dozen or so different Chinese dumplings and other tidbits in no time. I am not one of those people. Deep frying at home? No again. It splatters everywhere and makes the apartment stink. If I had a backyard, I might get a deep fryer and have at it. But for now, I say no to deep frying in my Brooklyn studio. Do I own the French Laundry Cookbook? Yes. Have I ever made one of the recipes? No. The number of components I'd need to make to concoct just one dish seems overwhelming - and way too time-consuming for someone with a day job. Now, I do make actual homemade ice cream, which seems like a major feat to some. However, to me, whipping up a custard, letting it cool, and then tossing it in an ice cream machine, doesn't seem like too much work. Making bread, though? Too much work. Besides, I live near some fantastic bread bakeries where I can get my baguette fix on in style and without the fuss. We all have our things that we want to make in our own kitchens, and others that we leave to restaurants and such. And, that's not a bad thing. It's just a thing.